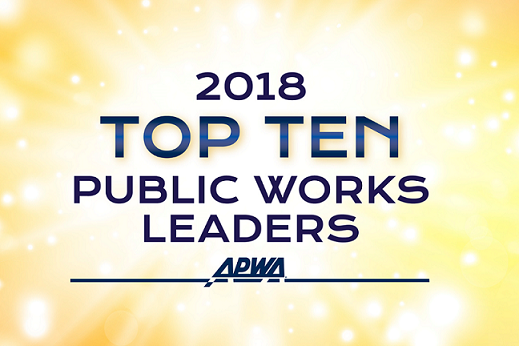 APWA has announced its Top Ten Public Works Leaders of the Year for 2018. The Top Ten Leaders award program recognizes the outstanding career service achievements of individual public works professionals from both the public and private sectors in North America. “The Top Ten Public Works Leader Award aims to inspire excellence and dedication in public service by recognizing the outstanding career service achievements of individual public works professionals and officials,” said APWA Executive Director, Scott Grayson. "Since its inception in 1960, the Top Ten Leaders award program has recognized 580 men and women who reflect the highest career standards of professional conduct for public works officials. The APWA Top Ten represent the best of the public works profession, and they are all to be highly commended on this honor. "